Well, I guess there’s only so much money to be made in pop-punk. 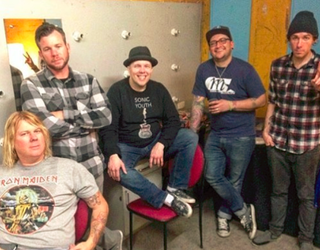 Former Ataris bassist Michael Davenport, who played with the band from 1998 to 2005 (rejoining for reunion shows in 2013 and 2014), was indicted last month on federal conspiracy and fraud charges, as the Santa Barbara Independent first reported. Davenport, along with fellow California resident Cynthia Rawlinson, operated a nationwide real estate telemarketing scam that cheated 100,000 people out of $27 million from 2009 to 2016. Although their scam was based in Santa Barbara, Davenport and Rawlinson even got to 104 victims in southern Illinois, not far from where the Ataris formed in Indiana. The pair operated under a variety of different names, most commonly American Standard (which totally sounds like the title of the movie someone should make about this story). Their plan was fairly simple: post ads on Craigslist for extremely affordable “pre-foreclosure” homes with limited information. After people responded to the ads, American Standard would then request a $199 fee to access the property information. At this point, it probably sounded way too good to be true, but Davenport made it even more alluring after revealing how easily prospective buyers could take over the mortgage. “The salespersons also said… that the customers could purchase the houses by simply taking over the homeowners’ mortgage payments, and the deeds to these homes would then be transferred into the customers’ names,” the indictment reads. Once they were given the property info, victims quickly realized the homes were either not up for sale or didn’t exist. American Standard then gave them further obstacles for getting a refund, telling victims to wait 90 days before sending a refund form and requesting “five copies of letters from property owners proving the homes were in fact not correctly listed.” So, yeah, of course they never got the refund. So, far from an airtight scam, but solid enough for Davenport to operate it for seven years while touring with his current band, Versus the World, and evade charges until this point. He’d been the subject of an ongoing investigation from the St. Louis Field Office of the Chicago Division of the United States Postal Inspection Service, and was apprehended at the Bill and Hillary Clinton Airport in Little Rock, Arkansas. He was toting $104,000 in cash which was seized by the authorities, and it all sounds like a perfect act III scene for American Standard, the movie. Davenport and Rawlinson are scheduled to be arraigned on January 17 at the federal courthouse in St. Louis.